Salt Hydrate is a crystalline form of salt that is linked to some specific number of water molecules. The name hydrate salts arise due to the incorporation of water molecules into the crystalline structures of salts. Salt hydrates could be found naturally occurring in the environment or can be artificially synthesized. Application of salt hydrates for air-conditioning buildings, food and beverages refrigeration, pharmaceutical and medical products storage and others is expected to propel the salt hydrates market robustly in various end-user industries on account of their wide range of uses. Salt hydrates used as PCM solutions are further expanding the market across various industry verticals. Salt hydrate market is anticipated to record a significant CAGR of 9.2% over the forecast period. Many multi-national companies are concentrating towards new product advances in salt hydrate. Moreover, the many advantageous properties of salt hydrate are exploited in the field of construction and medicine now and then. New uses for salt hydrate derivatives are discovered through research and development which is expected to drive the Salt Hydrate market rapidly. Currently the global salt hydrate market is observing vibrant growth owing to increasing demand of in-built residences and offices with cooling systems on account of increasing global warming. Advancements in pharmaceutical industry in the past few years and growing healthcare explorations is projected to drive salt hydrate market besides the wide range of functions of salt hydrate in an immense range of products such as medicines, PCM solutions, thermo-regulators and more during the forecast period. On the basis of regional platform, global Salt Hydrate market is segmented into five major regions including North America, Europe, Asia Pacific, Latin America and Middle East & Africa region. As a precursor to refrigeration in pharmaceutical industry, North America is panned to observe substantial salt hydrate market growth due to rising salt hydrate usage as phase change material. North America is estimated to be followed by Asia Pacific in terms of consumption due to expanding salt hydrate requirements in building and construction industries. On the back of increasing usage of salt hydrate in residential and commercial building due to the location of the region across the temperate zone of the globe and global warming hitting around the climatic conditions of countries such as India, China and others adversely, Asia Pacific is budding as a regional salt hydrate consumption market. The rising demand for salt hydrate and its by-products for various processes in pharmaceutical, textile, electronic and construction industries are expected to drive the market rapidly over the forecast period. 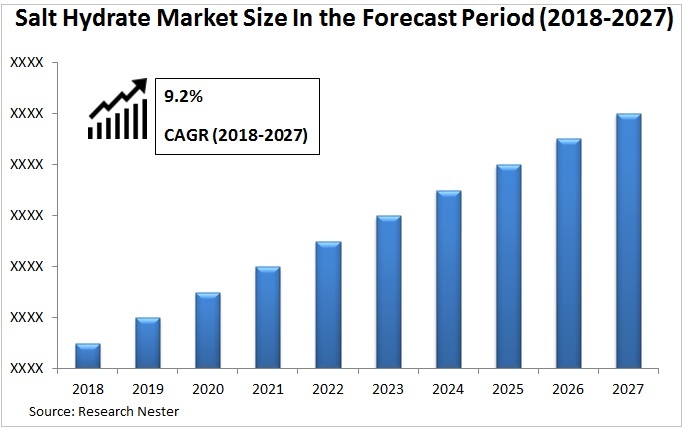 The growing R&D activity associated to salt hydrate is further expected to increase the market growth owing to the discovery of new applications of it. Properties of salt hydrates such as high energy storage density, relatively good thermal conductivity with multiple source availability at comparatively rational prices are estimated to drive the salt hydrates market sturdily in various end-user industries. Rapid industrialization and economic development with thriving manufacturing sector is expected to boost the salt hydrate market across the developing regions of the world. Moreover, increasing emission of carbon dioxide and rising fossil fuel consumption, sensible heat and latent heat storage has gained significant attention that is predicted to propel the salt hydrates market sturdily. The use of PCMs in industrial waste heat utilization, aerospace field, electric peak-shaving and more is anticipated to contribute significantly in the salt hydrate market expansion over the forecast period. Applications of salt hydrates in concentrated solar domestic hot water systems and in energy-effective construction industry are predicted to impact the salt hydrate market appreciably across the globe. However, corrosion of salt hydrates with mild metals leading to severe safety risks in building along with enthalpy decreasing caused by operational thermal cycling may lead to slower adoption of salt hydrates by small industrial manufacturers leading to slower growth of the salt hydrate market across the developing regions over the forecast period.